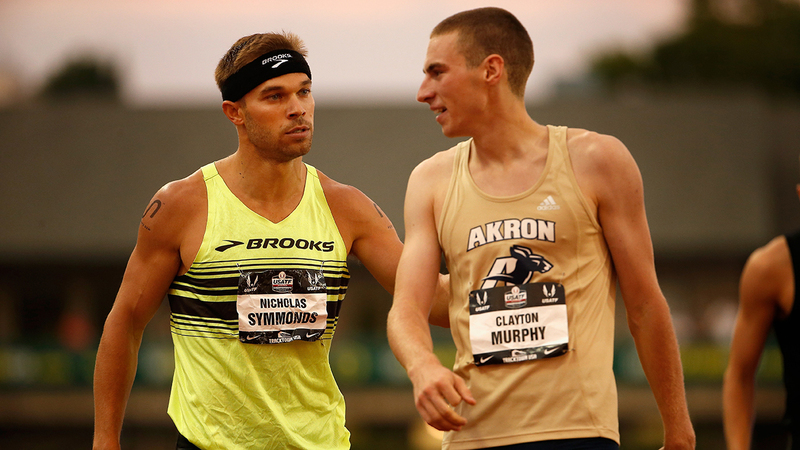 Because Murphy finished fourth at USAs, he was poised to join the American 800 squad if Symmonds declined his spot on the team. But he never thought that Symmonds would actually go through with it. Something would work itself out. Right? Forget about competing against world record holder David Rudisha, or being one of the youngest, most inexperienced runners in a 54-athlete field. Up until last Thursday, Clayton Murphy was mostly just worried about getting his damn passport in time for the 2015 IAAF World Championships, which begin Saturday in Beijing. This wasn’t some case of college-student procrastination. Murphy didn’t know he’d be competing in Beijing until last Monday, when USA Track and Field named him to the American roster. He quickly applied for a Chinese visa and forked over the dreaded expedition fee to ensure his participation. Most athletes knew of their Team USA status way back in June, when the USATF National Championships took place in Eugene, Oregon. There, Murphy had finished fourth in the 800, running a personal best time of 1:45.59. It was the culmination of a breakthrough spring for the University of Akron sophomore, who had placed a surprising third earlier that month at the NCAA Championships. Still, he wasn’t expecting to land a spot in Beijing — each country can enter only three athletes per event at worlds. The winner of that Eugene race was veteran Nick Symmonds, one of the biggest stars in American track and field and the reigning world silver medalist. Heading into the meet, however, Symmonds was thought to be in relatively poor form, having skipped out on the 2014 outdoor season after an injury to focus on less athletic pursuits, such as writing a book and getting into the chewing gum business. He even copped to having seriously contemplated retirement, and was considered only an outside contender to finish in the top three, let alone win. Naturally, this made Symmonds’s eventual victory all the more sweet. As he charged down the home stretch, he flexed his biceps — which are pretty impressive for a mid-distance runner — for the rapturous Hayward Field crowd. Then, upon crossing the finish line, he popped his neon yellow Brooks singlet. Suddenly, a strong showing in Beijing seemed distinctly possible. Under dispute: the specific definition of a team function, which Symmonds felt was too broad. He didn’t mind racing in the swoosh-adorned Team USA gear, but he wanted to be able to represent Brooks outside of competition. Otherwise, where was his sponsor’s return on investment? Because Murphy finished fourth at USAs, he was poised to join the American 800 squad of Erik Sowinski and Casimir Loxsom if Symmonds declined his spot on the team. But he never thought that Symmonds would actually go through with it. After all, Symmonds had always been an outspoken advocate of athletes’ rights — this was just par for the course — and there was no way he’d ever pass up the opportunity to defend his silver medal. Something would work itself out. Right? In fact, Murphy thought his track season was already over when he got the news. He had just won silver in the 800 at the NACAC Championships in Costa Rica, and was planning to take a short break from running before cross-country started in the fall. He even went so far as to begin indulging in junk food like nachos and soda with reckless abandon. So, does he still have enough figurative gas left in the tank to run well in Beijing? He certainly thinks so. While Murphy’s personal best is fairly pedestrian by world championship standards — this year’s field features six runners who’ve dipped under 1:43 in their careers — he seems to excel in the multiple-round format of a championship meet, where competitors must run in preliminary heats before advancing to the final. Usually, these races come down to the final sprint, as runners stick together early to conserve energy for later rounds. And, man, can Murphy sprint. Murphy also boasts prodigious endurance. While many 800-meter standouts just run cross-country to stay in shape during track’s offseason, this is not the case for Murphy. At Tri-Village Local School in New Madison, Ohio, he placed fourth in the state cross-country meet as a senior, running a blistering 15:32 for 5K. Upon matriculating to Akron, he immediately became one of the Zips’ top harriers, earning All-MAC second-team honors as a freshman. His 5,000-meter personal best — 14:15.61 — is staggeringly fast for a 1:45 800 runner. Murphy’s versatility has proved to be his greatest strength as a runner. It wasn’t even his intention to focus on the 800 this year — it just sort of happened by accident. “At the beginning of this year, I was focusing on the mile,” he says. But then he ran a blazing 1:47.06 at the NCAA Indoor Championships in March, good for third overall, and, well, how could he not reshuffle his priorities a bit? The 1,500, a.k.a. the “metric mile,” is run at most championship meets; the actual mile is run less frequently.